It's a dream come true. Disposable plates, utensils, and serving vessels that are both beautiful and sustainable. 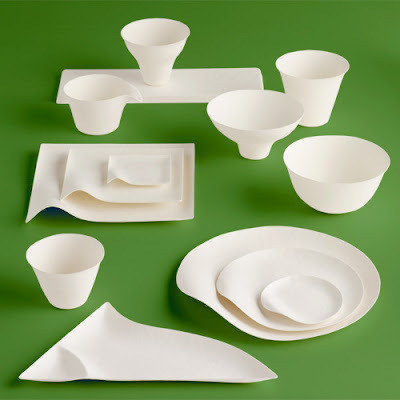 We all owe San Francisco-based Branch yet another HUGE THANK YOU for importing the Wasari tableware collection from Japan. Designed by Shinichiro Ogata, the collection is made form renewable resources such as sugar cane, bamboo, and reed and is manufactured in an ISO 9001 & 14001 certified factory in China. Cocktail parties and picnics will never be the same.